St John’s Church, Linlithgow, has recently appointed Keith Short as the new senior pastor, who now joins a team of four. Keith is married to Becky and they have three children and seven grandchildren. 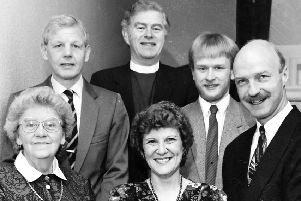 Following a career in the Royal Navy and business, Keith joined the church and served in Yeovil, Somerset before moving to Glasgow in 1992 where he remained as senior pastor at Bishopbriggs Community Church for seventeen years. He moved to Edinburgh in 2009 as pastor of City Gates Baptist Church in the north of the city. He serves nationally as leader of the Scottish Network of Churches, working with churches from all denominations across Scotland. He is also a member of the Executive Council of the Evangelical Alliance. Keith has a passion for church unity and longs to see the church play its part in the community. He feels strongly that the church should not only be a voice of hope but should also speak up against injustice and seek to reach out to those living on the margins of our society. Keith said: “I have been overwhelmed by the welcome and generosity that I have received both from St John’s and the wider community. “Life has been a bit of a roller coaster over the past few weeks. I am so looking forward to serving, not just the wonderful people who make up St John’s but also the wider community. “When asked what the greatest command was, Jesus responded by saying love God and love your neighbour. “It is so good to be part of a church that has all generations represented, where young and old alike serve their neighbours and are all passionate about their faith. Keith’s induction service will be held at Linlithgow Academy on Saturday, April 25, to which all are welcome.